Joshua Tree National Park is a characterized by rugged rock formations and stark desert landscapes. 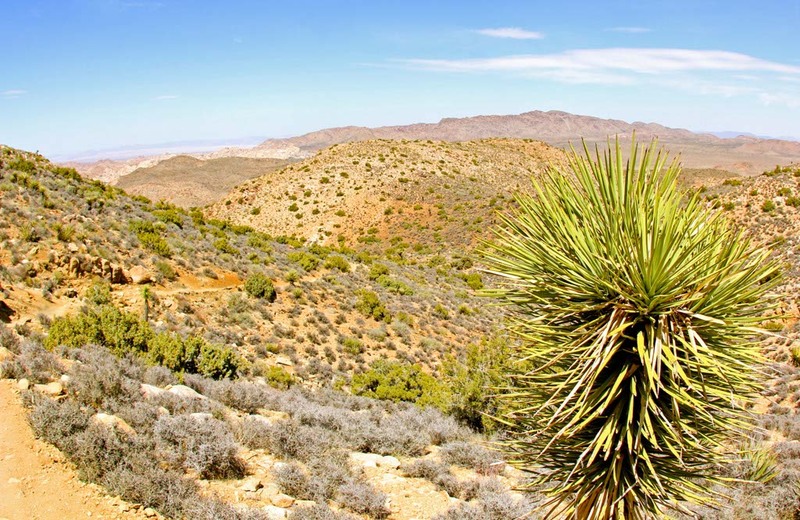 Named for the region’s twisted, bristled Joshua trees, the park straddles the cactus-dotted Colorado Desert and the western Mojave Desert. These two arid ecosystems create a profoundly contrasting appearance within the park. Even before moving to California, Joshua Tree was on my bucket list. 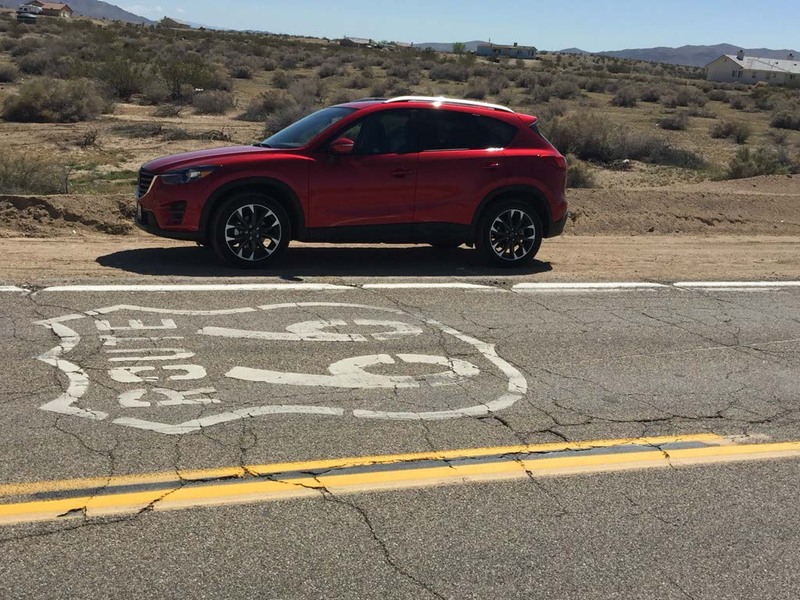 It was time I crossed my first visit off the list and I did it in style with the support of Mazda and their DrivingMatters campaign. Using Sheep Pass Campground as the starting point, I explored the park and the surrounding area during three extensive road trips. 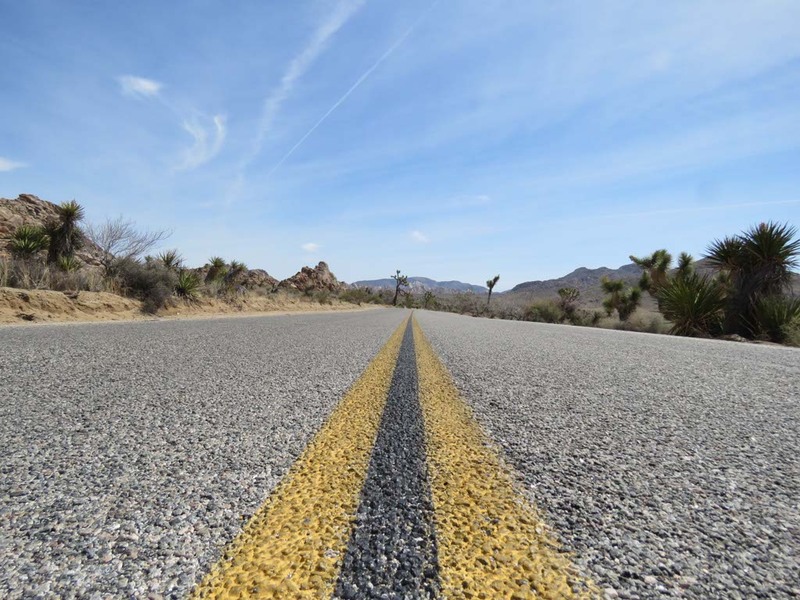 I explored Joshua Tree National Park then I spent a full day exploring the Saulton Sea area and finished off my adventure by driving sections of Route 66. 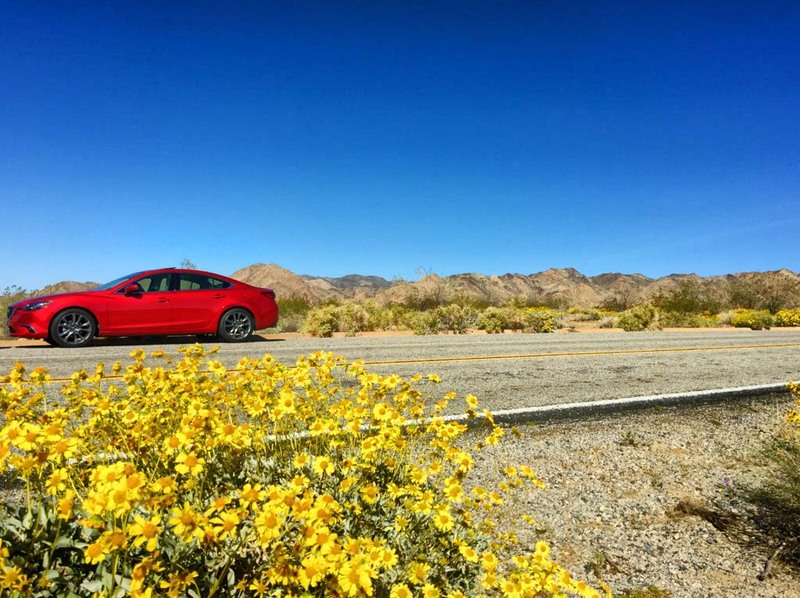 From ghost towns to slab cities, from a bottle tree ranch to a volcanic crater, from Joshua trees to cacti, I experienced it all during my Joshua Tree National Park adventure with Mazda. I drove out to Joshua Tree National Park first thing in the morning so I could spend the entire day exploring the park and setting up camp at Sheep Pass. I entered through the Yucca Valley and Joshua Tree stopping at Hidden Valley and Ryan Mountain. The entrance fee to the park is $20 and it’s valid for one week. The camp sites need to be booked in advance and there are several options throughout the park. 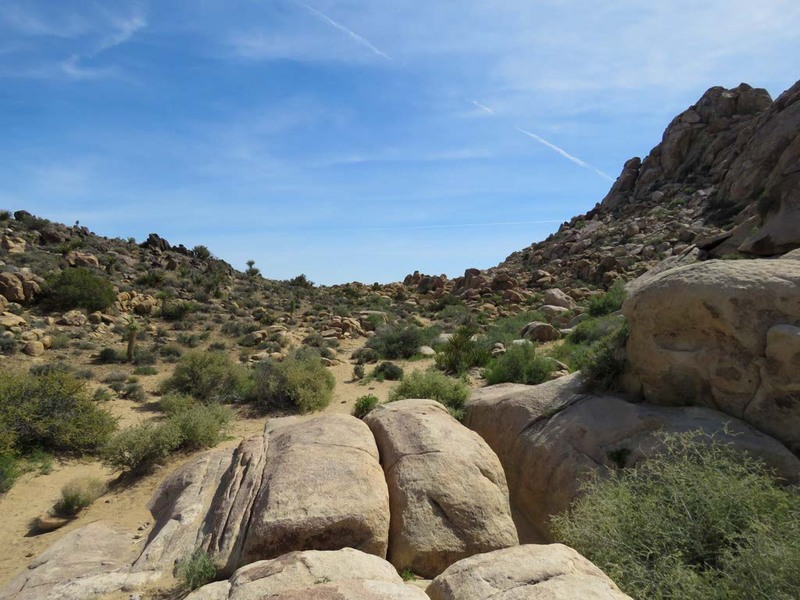 The Hidden Valley trail is a one-mile loop trail that starts at the picnic area and winds among massive boulders. It’s easily accessible and a relaxed trail with beautiful views. Signs along the nature walk help visitors identify the park’s plants and animals. The trail is mostly level, crossing through hard-packed sand, but does venture through some of the valley’s interesting rock formations. For added adventure, I climbed to the top of many of the rock formations and took in the panoramic views. It was a short hike that didn’t take up much of the day but it was a great introduction to Joshua Tree National Park. The Ryan Mountain trail is a little more intense at three miles round trip. It’s a moderately strenuous hike to the 5,458-foot summit and has lookout points with views of Queen, Lost Horse, and Pleasant Valleys. The summit of Ryan Mountain is the best place to get a top-down view of the heart of Joshua Tree National Park. This hike can be demanding at times and lots of water is recommended. 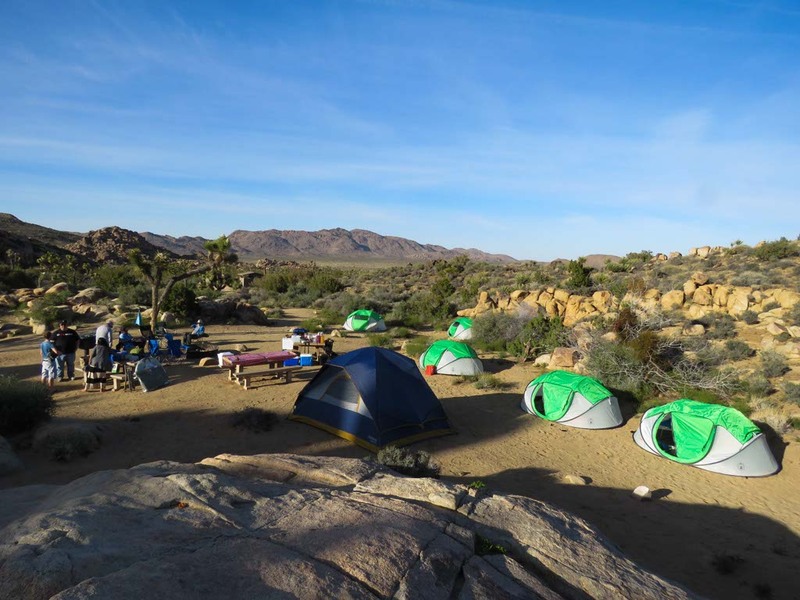 Sheep Pass Campground, one of three group campgrounds in the park, is located toward the center of Joshua Tree, and has easy access to several hiking trails. It’s nestled at the foot of huge boulders in a desert setting with no potable water, but there are picnic tables, a fire ring, and two pit toilets. There is no cell, text, WiFi, or TV service at Sheep Pass. We made Sheep Pass our home base where we slept, ate breakfast and dinner, watched the night’s sky, and shared stories of our daily adventures. My first road trip from the park was to Salton Sea area. We took the Pinto Basin Rd south east from Joshua Tree National Park and road the switchbacks down the mountain. Salton Sea is one of the strangest places I’ve visited in all of California. Originally it was designed as a playground for Hollywood’s elite, but it’s now a desolate, baron desert with bizarre art communities, massive art sculptures, and few people. Salton Sea State Park and Visitor Center has camping, hiking, beach access, and fishing access but none of these things are what brought me there. The post-apocalyptic scene on the beach was what drew me to Salton Sea State Park beach. The shoreline is littered with thousands and thousands of dead fish. It is as disgusting and smelly as it sounds but too odd to miss. Not far from the Salton Sea State Park and Visitor Center, is Bombay Beach​. Basically a ghost town with a little under 300 residents, this whole area in the 40’s and 50’s was going to be California’s version of the French Riviera. 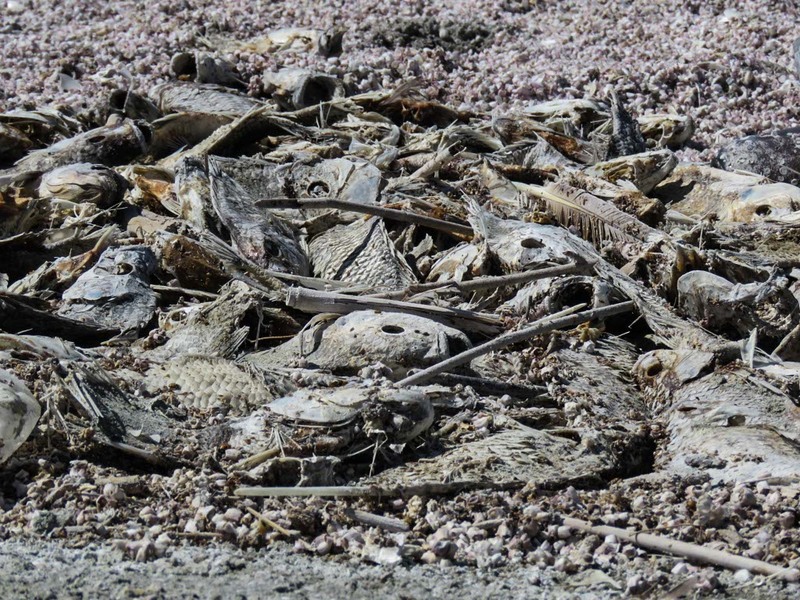 A number of problems arose including increasing salinity in the Salton Sea, which created major fish and bird die­-offs, and a series of floods from tropical storms in the 70’s. The area has never recovered and now lays in basic ruins. 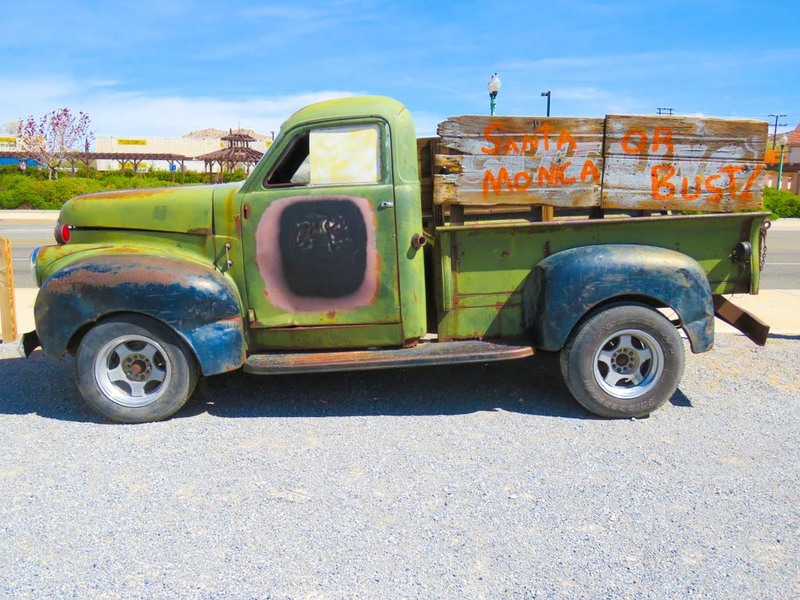 There are still a few residents at Bombay Beach and we found an outdoor entertainment venue in the heart of the town. I can only imagine how crazy things get at parties here. 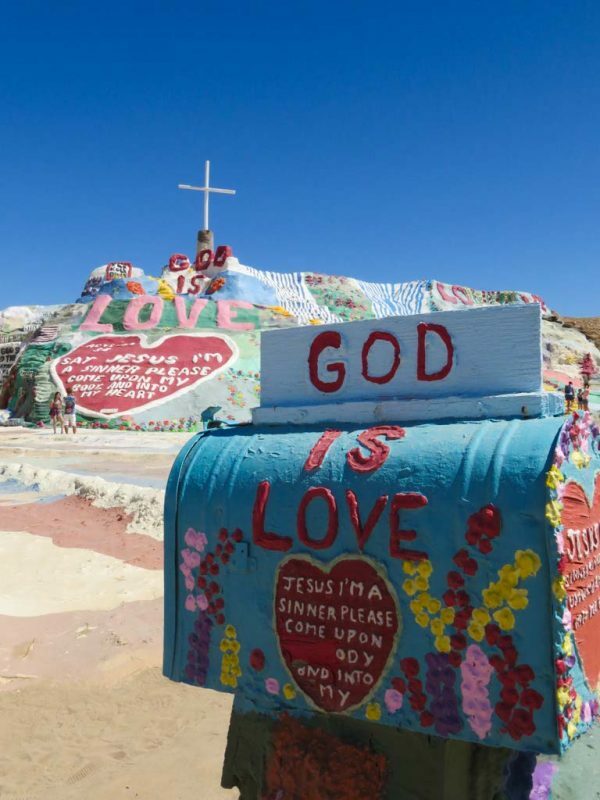 Salvation Mountain, a short drive from Bombay Beach,​ is Leonard Knight’s tribute to God and his gift to the world with its simple yet powerful message: “God Is Love.”Leonard’s passion has lovingly created this brilliant “outsider art ” masterpiece resplendent with not only biblical and religious scripture such as the Lord’s Prayer, John 3:16, and the Sinner’s Prayer, but also including flowers, trees, waterfalls, suns, bluebirds, and many other fascinating and colorful objects. Salvation Mountain must be seen to be fully appreciated and after making the journey for myself I can attest. Its 50 foot height and 150 foot breadth is made totally of local adobe clay and donated paint. 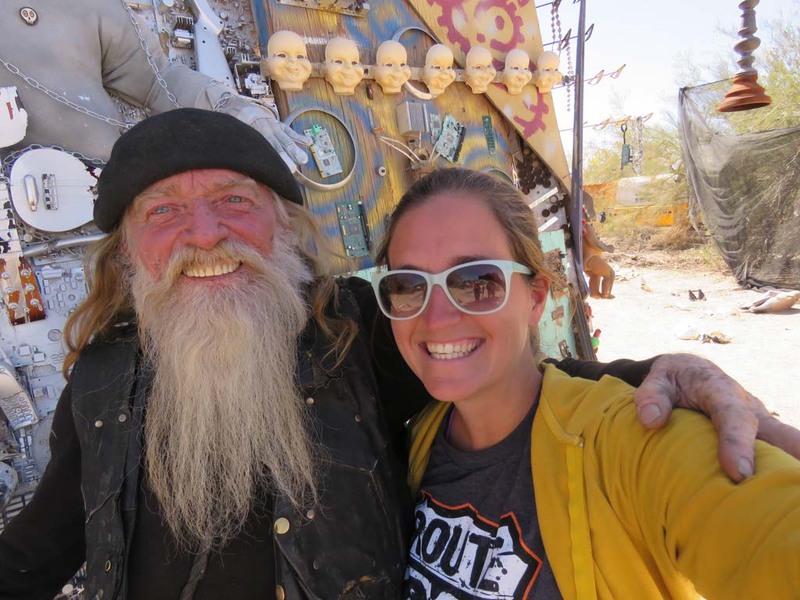 East Jesus​ is an experimental, habitable art compound located in the famous Slab City of Niland. It’s so close to Salvation Mountain, that it would be possible to walk if the desert sun didn’t make five feet seem like one hundred. It is a creation in progress originally built by Charles Russell and his friends. 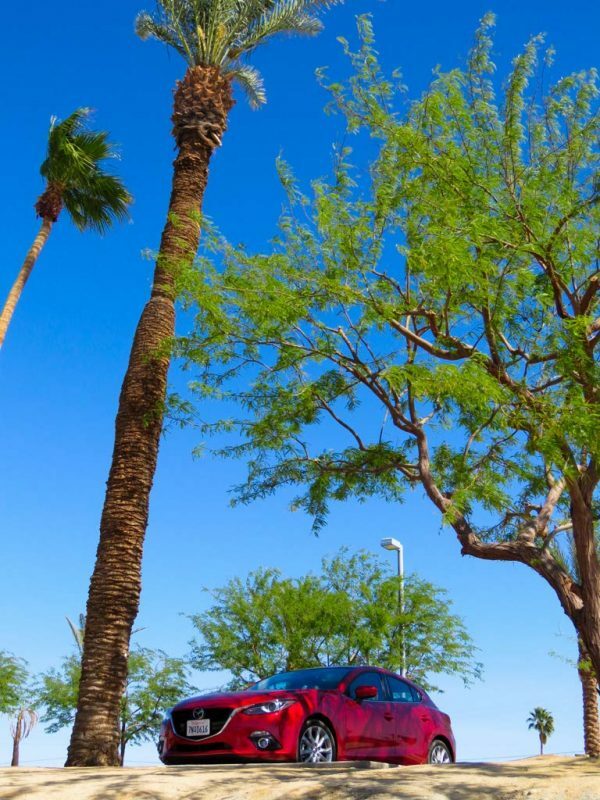 They feature a sculpture garden, art cars, Walter the 35 degree bus, as well as a selective residency program for artists and sustainability experts. This place was officially the most unusual place I visited. A local resident showed us around and told us about the history and art of East Jesus. He smelled like he hadn’t showered in months, which seems about right since they have no running water or electricity. He talked about how they eat, drink, and survive and I could almost see the appeal of such a lifestyle. He even showed us their private living quarters and the bus where they host guests. I was invited to stay but I don’t think I’d fit in with a four year old. After over an hour of chatting with him, the desert sun was too much for me and I had to say my good-byes. East Jesus was our last stop on the Salton Sea road trip. We made sure to grab a meal and gas up in Niland before heading back to Joshua Tree National Park. Gas stations are few and far between in the Salton Sea area so fill up as often as possible. Route 66 in California runs from the east in Santa Monica on the Pacific Ocean through Los Angeles and San Bernardino to Needles at the Arizona state line. 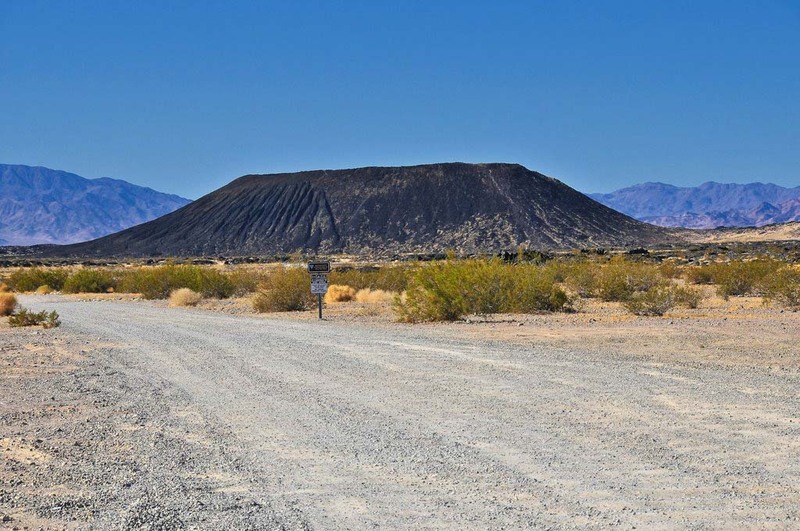 I picked up the route at The Summit Inn in Oak Hills and followed along through to the Amboy Crater​. Much of the original route has been lost or rerouted, and surviving landmarks are scattered, but I still pieced key points together with worthy detours sprinkled in. 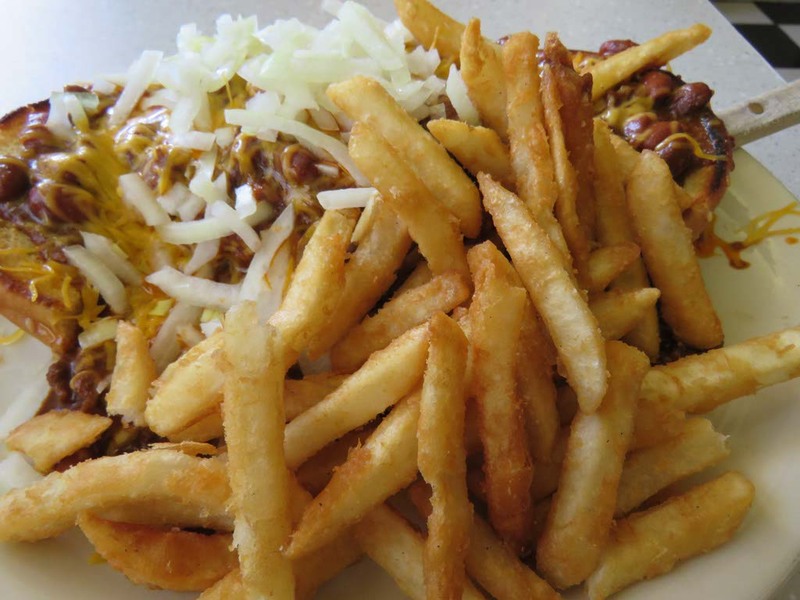 The Summit Inn is a typical 50s diner that has been around since 1952 and has had the same owners for over 50 years. It’s truly a “kitchy” spot with a long connection to the area. I opted for the Chilli Size Burger and fries with a chocolate shake. The portions are American-sized and it’s pretty much all you’d need for the rest of the day. I really felt like I was on a cross-country road trip in the 50s with this place. It was a step back in time. California Route 66 Museum​ ​is an Interactive museum with over 4500 Sq. Ft. of floor space and photo opportunities for the visitors to share memories in such settings as a 50’s diner and a VW Love Bus complete with hippy wigs and sunglasses for that perfect shot. There’s a Route 66 video playing in one of the rooms and it highlights all of the best Route 66 stops in California. I spent half the time in the museum playing and taking photos in the VW Love Bus and then imagining driving all of Route 66 in a truck like the one above. 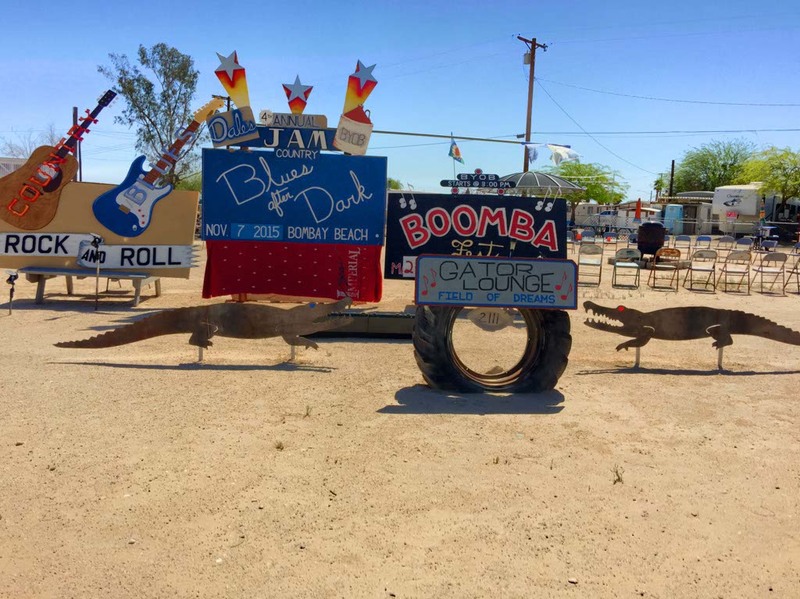 Route 66 truly does have a fun, crazy history. Elmer’s Bottle Tree Ranch​ ​is two acres of desert chocked full of hundreds of art sculptures, made from welded pipe and bottles by Elmer Long, who began in the 1980s. Although it’s private property, the gates are usually open and I talked with Elmer himself for well over an hour. He explained that his father started the ranch and he picked it up from there. He’s married with children and grandchildren and he loves discovering hidden gems in the desert. 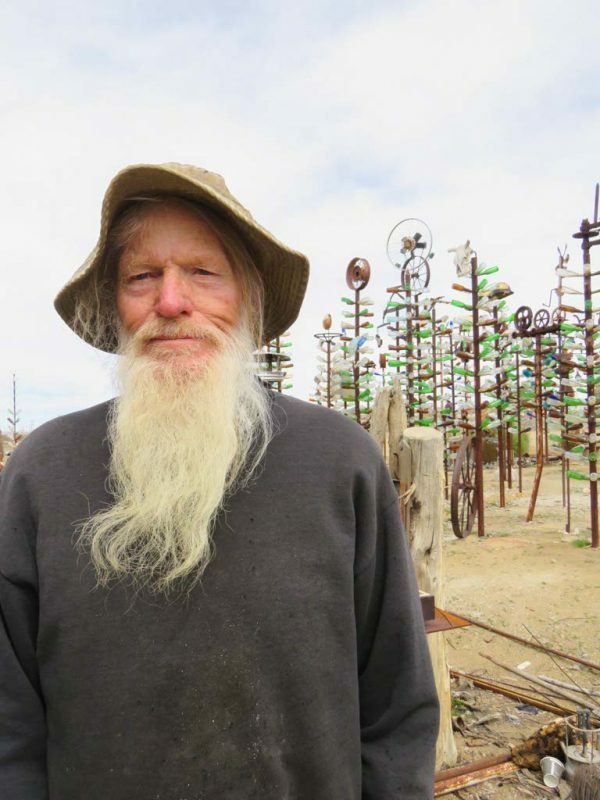 His desire to spread the art to the back of the ranch might make for a more elaborate set-up in the future, but there are already dozens of bottle trees in the front and guests are usually greeted by Elmer. 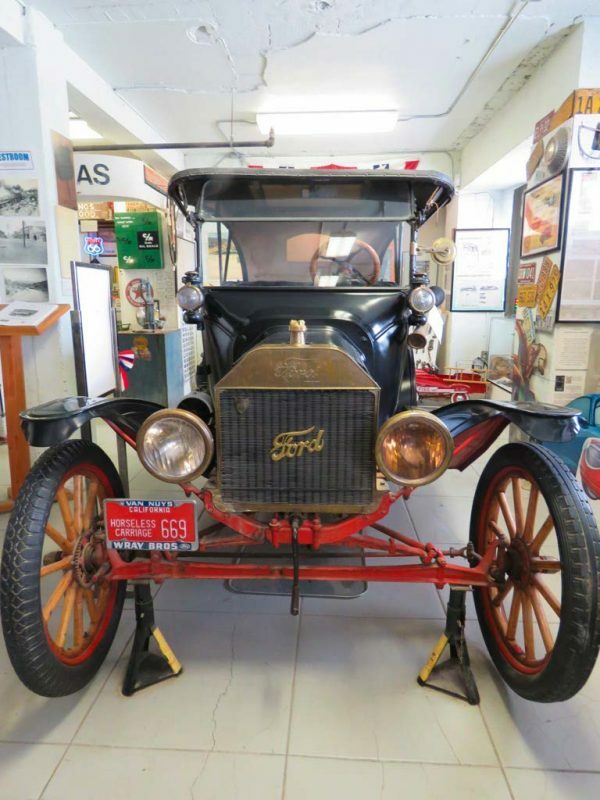 Barstow’s Mother Road museum displays a collection of historic photographs and artifacts related to Route 66 and the Mojave Desert communities. Displays include development of the United States Route 66 from early pioneer trails, railroads, automotive history, businesses, and sites. I learned more about what it was like to experience Route 66 in it’s prime from many handouts, books, and videos at the museum. Just outside of Barstow is Calico Ghost Town. Calico is an old West mining town that has been around since 1881 during the largest silver strike in California. With its 500 mines, Calico produced over $20 million in silver ore over a 12-year span. When silver lost its value in the mid-1890’s, Calico lost its population. The miner’s packed up, loaded their mules and moved away abandoning the town that once gave them a good living. It became a “ghost town.” Today Calico is part of the San Bernardino County Regional Parks system. 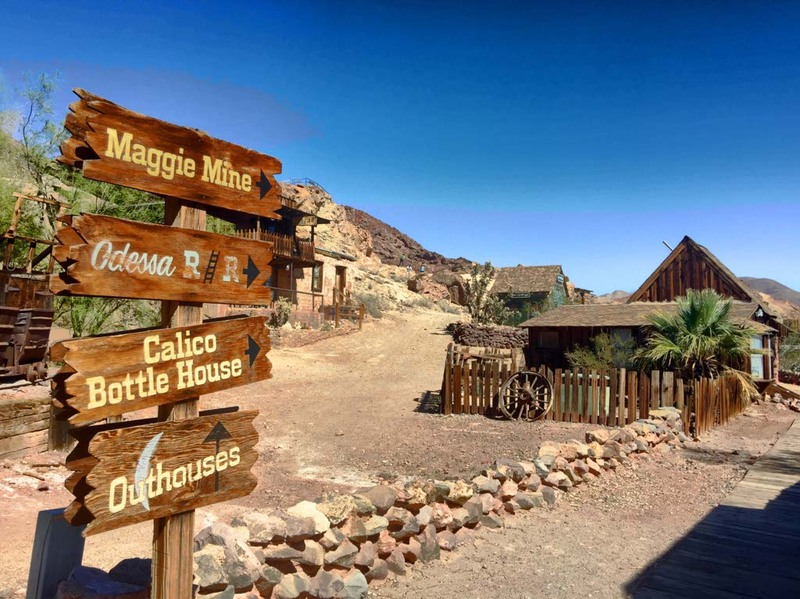 Along with its history and attractions, Calico Ghost Town has shops, restaurants, and offers camping and outdoor recreation. I rode the train and listened to the history of Calico from the conductor. Mine tours and off-road adventures are available on-site along with camping and biking/hiking trails. You could spend an entire day at Calico, but it’s wort stopping even if you only have an hour. Amboy Crater​ ​was designated a National Natural Landmark in 1973, it was recognized for its visual and geological significance. The inside of the 250′ high crater contains two lava dams behind which has formed small lava lakes. These are now flat in general appearance, covered with light colored clay, creating the impression of miniature “dry lakes.” Beyond the crater lies 24 square miles of lava flow containing such features as lava lakes, collapsed lava tubes and sinks, spatter cones, and massive flows of basalt. It was my last Route 66 stop before returning to Joshua Tree National Park. Joshua Tree National Park is a great starting point for local road trips or a destination in itself. Boulders and buttresses, rugged mountains, gold mining ruins, desert plains dotted with Joshua trees, art colonies without running water or electricity, post-apocalyptic fishy beaches, ranches made of bottle trees, —this is one weird place but it’s an adventure you’ll never forget. You could spend one day in Joshua Tree or several and you’d find something unique and beautiful every day of your experience. Joshua tree is definitely on my list during our road trip of the U.S. An interesting bit about The Salton Sea. The whole area seems to be so wacky and bizarre, which makes me want to see it even more. That red Mazda car sure looks pretty! The whole area is very bizarre. I think it’s the most bizarre area of California. When are you road tripping in the US? Which states are you visiting? I’ve seen Salvation Mountain on a couple tv shows and movies. I always wanted to visit. It is on my list. It was my first visit too. Very interesting and worth the trip. What a cool trip! I love road trips and it looks like you had amazing car! 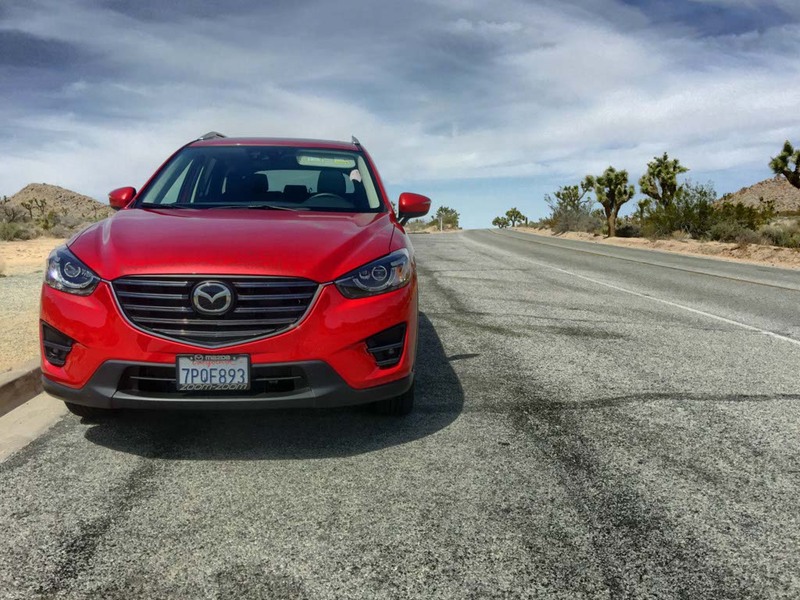 It was my first time driving the Mazda CX 5. I loved it! What type of car do you drive? This is my dream trip. I want to see it all, but I’d like to spend more time in each spot especially Route 66. I’d like to drive the whole route. What causes it to happen in Wisconsin? I didn’t realize it was a “popular” occurrence. Wow, that looks like a fun road trip. My kids would love hitting Route 66, as far as they know made famous by the Disney Cars movie but another reason for the next generation to enjoy it. I would love to go national park hopping. So many magnificent sites to see. Thanks for sharing a glimpse of Joshua Park and Route 66. There are lots of Cars posters and cool spots that were in Cars along the route. I’m looking into staying at Wigwam Motel because of the Cars movie. So many fun, interesting places to stop. I love those photos. It looks like some great memories were made! You have seriously convinced me that I need to road trip more. All of these pictures are just so amazing! Looks like an amazing trip! Love your pics! Great stories and photos, Lesley. I’m afraid mine will pale by comparison. I look forward to reading posts and seeing photos from others on the trip. There were some amazing photos taken. I’m glad to see that you made it home safely. Hopefully we’ll meet on the road again. Me, too, Lesley. When I told Kris of your skydiving adventures, she said, “We could do that.” Not we, maybe her. Til the next time. Haven’t been to Joshua Tree but have been to the Salton Sea. The Salton could be a goldmine for California if the politicians would stop bickering over what to do. Your trip has been fantastic, must be nice!! I love these photos! What a beautiful, isolated, crazy place – I love it! I love all of the photos that you shared from your trip. There were certainly a lot of beautiful sights to see and I love all the nature that you were fortunate enough to experience. Omg this would be an incredible trip!!! Hopefully my travels take me on such a trip one day! Wow so much to do for sure. It sounds like such a great time. I love going on road trips and seeing new things, and meeting cool people. I’ve seen people going to salvation mountain a lot and I’d really love to visit as well. This looks exactly like the road trip adventure I could use right now. I have always been intrigued by this part of the country. Looks incredible and immensely fascinating, though I’ll skip that chili burger. I can’t wait to see what weirdness you promise to come!